British school dinners have traditionally had a bit of a bad reputation. 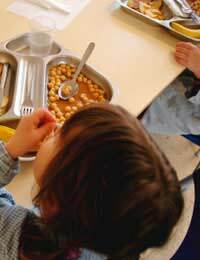 Despite the fact that having food available at school is a good thing for children, (it is never a given that children will get 3 balanced meals a day), the quality of food cooked at the school has traditionally been quite poor. It has tended to range from boiled cabbage and over-cooked foods, to ‘out of a bag’ poor quality meat-based fast foods. Our experience of great vegetables like sprouts or the afore-mentioned cabbage has been scarred for life after having it badly cooked and often badly presented, at primary or secondary school. Worse than that, is the poor quality of raw ingredients traditionall used: meat that really has very little meat within it, being mainly rusk, reconstituted meat or offal-based produce. This has been the quality choice schools and the meal planners have had to make when faced with rising prices and limited funds for food. Jamie Oliver, the celebrity chef and media star, saw the problem with school dinners and has tried to draw light to the situation, going a long way to change things. With a sometimes stark, but always illuminating, series on Channel 4 TV, Jamie Oliver highlighted several schools, the food they were preparing on a daily basis, and some of the kids eating the food. He showed the stresses the dinner ladies were under, the financial juggling act that senior education mangers have to perform to get any money for local schools to buy any food at all, and most worryingly of all, he examined the health issues associated with eating such poor quality food. This includes attention-deficient disorder (ADD), and a range of other health problems, including asthma, that seem to be associated with a diet high in sugars, salt, additives and preservatives. The programme didn’t shy away from the difficulties of changing children’s eating habits. Who can blame kids for preferring chips to spaghetti Bolognese?But Jamie Oliver and his team came up with creative solutions to all these problems, and sensitively worked behind the screen as well to work with the kids, often on a one to one basis, with the dinner ladies, the school managers and most importantly the parents and the politicians, to work toward one goal – better food, at a reasonable price. Of course, it shouldn’t have been left to a media personality to highlight this sad state of affairs, but the issue became very hot through his investigation and efforts, and the benefit, as well as being very good television and the creation of some more media personalities in the kids and dinner ladies, is that such an important area, which really does affect the health of the nation, has been improved. What would tomorrow’s Britain be like if the kids of today subsist at school eating really bad quality food, or just chips, or white bread and jam sandwiches, day in day out? Due to the success of Jamie's campaign we are now seeing more and more schools introducing a much healthier menu for school dinners. Many schools around the country are ditching tuck shops in favour of more healthy options, with some schools banning the sale of crisps, sweets and fizzy drinks all together. If this common sense approach to school dinners continues, then in a short time we could see our children's eating habits improving rapidly.